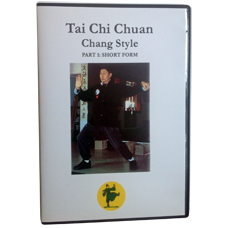 Tai Chi Chuan, Chang Style Part 1 (DVD) was created to assist the student in learning the Chang Style Short Form. This DVD begins with a slow motion demo of the complete Short Form in its entirety. It then breaks down to the form into individual postures and techniques for greater study and practice. In addition, the practical self defense applications are featured next. This DVD is 66 minutes in length. Chang Style Tai Chi was created by Grand Master Chang Tung-Sen. Master Chang was Chinese Martial Art’s late historical legend. He had been the undisputed Kung Fu Champion of China since 1933. He had been the head instructor at the Chinese National Academy of Martial Arts, the government Martial Arts Academy. In his Chang Style Tai Chi, he blended Shaolin, Tai Chi, Pa Kau and Shuai Chiao into one unit. Chang Style Tai Chi is the ultimate system for health and self-defense. The Chang Short Form is especially beneficial to those who have a limited amount of time available for practice. Continued regular practice of the Short Form will increase one’s overall health and can improve one’s health condition, as well as condition the student in the self defensive applications of the technique.